Navigating the world of engagement rings can be confusing, so going into the store as informed as possible about what you (or your future bride!) want in terms of not only the cut, clarity, and color of a diamond, but also the style and story behind it, can make things a lot easier when looking at types of engagement rings. There are countless engagement ring styles out there, so we at Diana Jewelers of Liverpool, NY have broken down the basics to help you make the perfect selection! If your fiancÃ©e prefers something a bit more unique, the oval-shaped Marquise cut, ending in points at the top and bottom of the diamond, is right for her. If she'd like an oval shape with more rounded edges, then the Cushion cut (sometimes called the Pillow Cut) is more ideal. 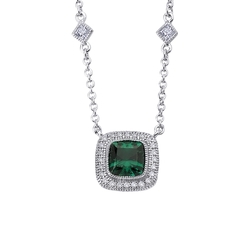 For the woman who wants her ring to make a statement, the Emerald cut, perfect for showcasing large stones with its rectangular shape and tiered facts, will certainly shine. 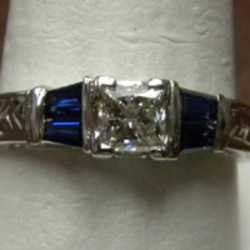 Similarly, but best for smaller stones, is the Asscher cut, which is square in shape and cut to ensure maximum sparkle originating in the stone's center. One of the most popular cut is the Princess, which is strictly square and cut like an inverted pyramid. 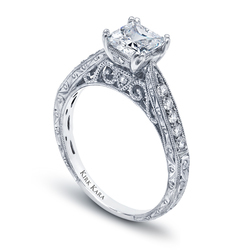 It is designed to give the most "sparkle" and, though first created as recently as the 1960s, has become a staple in the world of engagement ring styles. 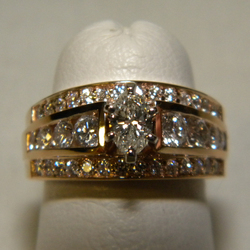 Equally desired is the Round cut, which is circular in shape and cut with multiple facets to bring out the bling. The Heart cut is what the name implies literally cut to resemble the heart for the more playful and romantic bride-to-be. 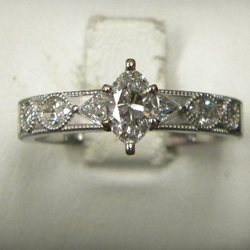 The Pear cut is also a more unique shape, resembling a teardrop and said to elongate the look of the finger. Finally, the oval cut is ideal for those who wish to have the most coverage of the finger combined with a regal and elegant look. 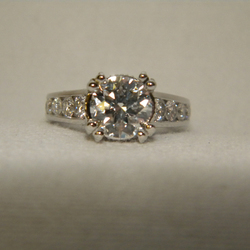 At Diana Jewelers, located at 911 Old Liverpool Road, Liverpool, NY, we take great pleasure and pride in helping you create the perfect setting and stone to sweep her off her feet. No matter the cut, the quality of our stones and the expertise of our owners will make shopping for engagement rings as pleasurable as the engagement itself.